Last month I shared that the Alliance received a scholarship through the Network for Regional Healthcare Improvement’s Getting to Affordability initiative, funded by the Robert Wood Johnson Foundation, for registration and travel to the National Affordability Summit in Washington, D.C. on September 27th. We have just returned from the summit and I am eager to share some of our key takeaways. I left the conference feeling optimistic and even more convinced of the importance of the Alliance’s work. It was heartening to be in the same room with people from across the country who are passionate about improving the affordability of the health care system, knowing that we are all fighting the same battle. The overarching goals of the summit were to gain a deeper understanding of why health care costs so much and discuss actionable strategies that can move the market to value. These goals dovetail with our mission at the Alliance, and there were several areas of focus I wanted to share. The meeting started with a story from Families USA about Alma, a young girl and her family who battle cystic fibrosis and the insurmountable costs of care. It was a compelling reminder to all of us that health care is personal, and that it is about individuals. Harold Miller, President and CEO of the Center for Healthcare Quality & Payment Reform, gave an insightful talk in which he discussed how the health care payment system is a barrier to finding a solution, because providers aren’t paid for many high-value services. He promoted a bottom up approach where payers adequately compensate healthcare providers who are on the front line of care and hold them accountable for quality and efficiency. The Alliance team felt that progress depends on a multi-stakeholder approach, including a top down and bottom up approach. Niall Brennan, president of the Health Care Cost Institute, said, “Translating data into action is really hard. People can be seduced by organizations that make this sound easy.” This is an area of focus for the Alliance and we are moving toward including “Action Steps” in our reports that can help people move from knowledge to behavior change. However, we know this is a long-term endeavor and requires the participation of many stakeholders. Along with reports being actionable, they must be accessible. Digesting complex reports entails a high cognitive load and we should keep in mind that our audience may not have the time to dive in, digest and discern key takeaways. One of the broader themes was that we all need to reframe the national health care conversation from one centered on insurance to one focused on the actual cost and quality of care. The public narrative sometimes overlooks the fact that the cost of insurance won’t go down until we tackle the root cause. While this is not new information to Alliance members, it was a good reminder that we need to do a better job of getting this message out to the general public. It was wonderful to spend more time with these members of the Alliance and be able to share in this learning experience. 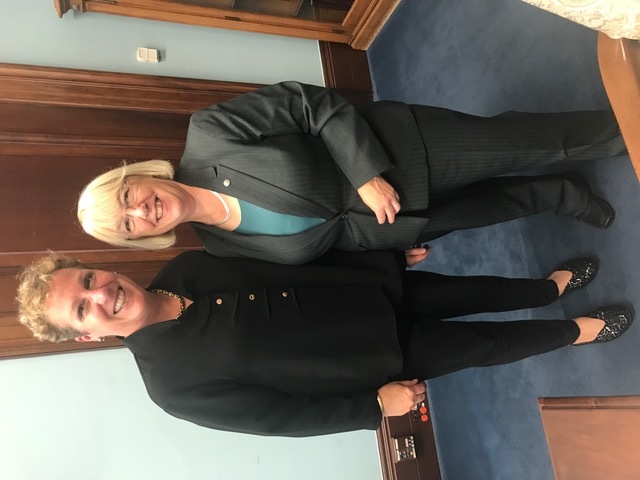 While in D.C., Elizabeth Mitchell, CEO of the Network for Regional Healthcare Improvement, and I were privileged to meet with Sen. Patty Murray (D-Wash.) and one of her senior health policy advisors. 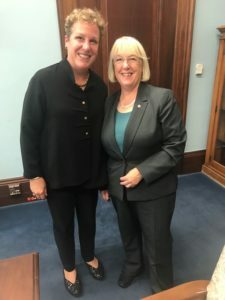 I expressed our thanks, representing all Alliance members, for the Senator’s exceptionally hard work on health care issues for Washingtonians and for all the citizens in our country. I shared the Alliance’s Hospital Value Report and information about our opioid work. Sen. Murray was very engaged and asked good questions about our work. She told me she views the Alliance’s work as a role model for the nation. Thank you, Senator, for taking the time to meet with us! And thanks to all of you for being engaged and informed members and for your commitment to help make Washington state a better place to give, get and pay for health care. As I return from the National Affordability Summit, I am encouraged about the progress being made locally and nationally, and look forward to continuing that work with you.